A theoretical investigation has identified several clusters that could contain a double π bond between two beryllium atoms, marking the first bond of this type between s block metals. Multiple bonds between transition metals are widely known, but low electronegativity and ionisation energy mean that this is not true for elements in the s block. As beryllium has the highest electronegativity in the s block, it is the most promising candidate for multiple bonding. 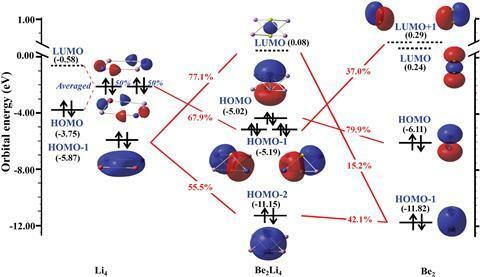 Now, a collaboration between researchers in China, led by Yihong Ding of Jilin University and Zhongmin Su of Northeast Normal University, has shed new light on how a Be–Be double π bond could be stabilised. The bond is theoretically possible within an octahedral cluster consisting of two axial beryllium atoms and four electron-donating equatorial ligands. Under normal circumstances, adding electrons to the Lumo (lowest unoccupied molecular orbital) of beryllium is difficult due to its high energy. Therefore, suitable ligands must be able to lower this energy to a point where the orbital is able to accept electrons. The ligands of choice are metals such as lithium and copper as they can donate electrons into the empty π orbitals of beryllium without breaking their degeneracy.